We put forth for our clients Multipurpose Shower Baths -VS-809, which are manufactured as per the standards set by regulatory bodies. Bathtub with 4 body massage jets, 6 back massage jets, and in-built toiletries & tower rack have made our multifunction cubicles popular among clients. These are energy efficient, cost effective and available in 1500x1500x2150 mm size. We "Hightide Buildtech International Private Limited" since 1992, are one of the leading exporter, manufacturer, supplier, wholesaler, trader, retailer and importer of Bath Tubs, Whirlpool Baths, Shower Partitions, Steam Generators, Shower Panels, and Spa Pools. 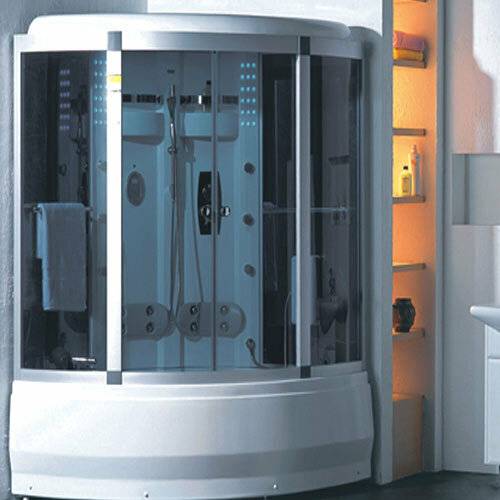 Apart from these, we also provide Sauna Rooms, Steam Sauna Rooms, Shower Cubicles, and Multi Function Cubicles. These are manufactured using quality raw material that is sourced from U.S.A., Italy, UK, Malta and Finland. Available in various specifications, these are widely used in resorts, beauty parlors, and health clubs. Our professionals stringently test our entire range on various parameters such as design, performance, and energy consumption. This helps us in supplying defect free equipment and maintaining our market goodwill & credibility. Due to the unflinching efforts of our professionals, we have served to the requirements of more than 10,000 customers till date. This is a testimony to our enviable position in the industry.